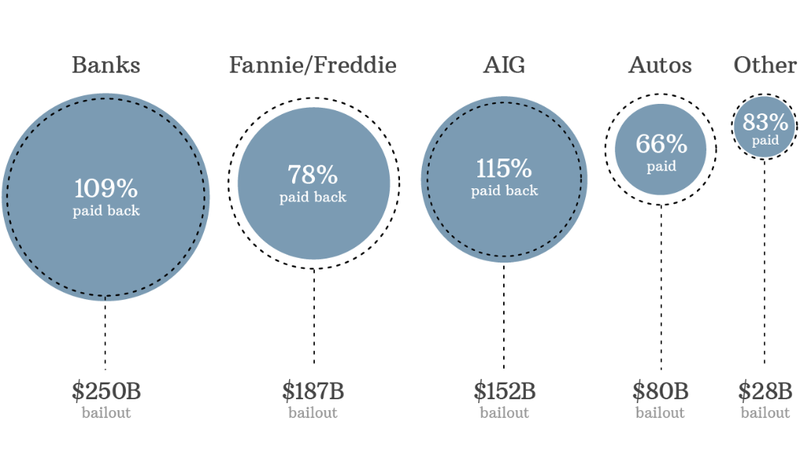 Taxpayers are still owed $30 billion on all the federal bailouts approved during crisis, but they could turn a profit soon. Five years later, taxpayers still haven't broken even on the $698.2 billion in government bailouts issued during the financial crisis. But we're getting close. The bailouts, which include money disbursed through TARP as well as other funds used to shore up Fannie Mae, Freddie Mac and AIG, may even show a profit by the time the sixth anniversary arrives. So far, Treasury and the Federal Reserve have recouped $670 billion of those funds. That's far more than could have been imagined in the dark days of 2008. Most of the money has been returned to U.S. coffers via the sale of stock in the companies that were rescued. The firms also repaid the government by selling off assets and making loan and dividend payments. The Trouble Asset Relief Program, which was the most publicized and controversial part of the bailouts, was created to help the faltering U.S. bank system. Treasury used it to pump $250 billion into banks both large and small in order to shore up their capital, and to keep them lending money to consumers and businesses. In return, Treasury got stock and warrants in the banks, which it later sold at a profit. Treasury has already sold the shares it owned in major banks, such as Citigroup (C) and Bank of America (BAC). But it's still slowly selling off the stakes it has in many small banks, which should make the banking portion of the bailout slightly more profitable. The insurer was rescued by the Federal Reserve, which pledged $85 billion in help in the days following Lehman Brothers' 2008 bankruptcy. AIG ultimately received about $152 billion from both the Fed and TARP. The government turned a profit by selling its shares of AIG (AIG), as well as by pocketing the proceeds from the sale of the company's non-core units. Both TARP and the Fed ended up making a profit on the AIG rescue. Related: 5 years after Lehman: Where are the key players now? General Motors (GM), Chrysler Group and Ally Financial, the finance firm then known as GMAC, together received $79.7 billion in help in 2008 and 2009. While some of that assistance came in the form of loans, most of it was was given to the companies in return for their stock. Stock sales, dividend and loan payments together have returned only $52.7 billion to the government, leaving a $27 billion deficit. Ally, two-thirds of which is still owned by Treasury, is expected to repay another $6 billion this year. Treasury also owns roughly 100 million shares of GM, which are worth about $3.6 billion at today's market prices. Those stakes should help narrow the government's loss on the auto bailout. But it's doubtful that taxpayers will be made whole on the $80 billion the industry received. The two mortgage finance firms were bailed out a week before the Lehman bankruptcy, and eventually received $187 billion in funds between them. But they've already repaid $146 billion of that, and Freddie has signaled that it may make another payment of as much as $25 billion later this year. In addition, both companies are now profitable once again thanks to the recovery in the housing market. Since all of Fannie's and Freddie's profits flow directly to Treasury, that should mean billions of dollars in additional payments. Related: Are we ready for the next meltdown? This category includes a number of short-term programs that helped restart financial markets that froze up in the crisis. They gave money to asset managers to help them buy toxic mortgage securities from banks, hedge funds and other investors. Treasury made a $4 billion profit on those programs. But it also spent $9 billion to assist struggling home owners, and that's one area where losses might continue to climb.